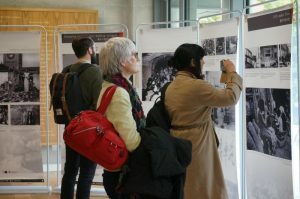 “Twin Cities under Attack: London and Chongqing during World War Two (1937-1945)” is an exhibition of historical images of the London Blitz and the Chongqing Bombing jointly curated by the University of Oxford China Centre and Chongqing Library. It documents the painful experiences of the two wartime capitals being heavily bombed by Germany and Japan respectively during WWII and the unyielding spirit shared by the people living in these two cities in the face of suffering. The British exhibition site is the University of Oxford China Centre while the Chinese site is the Chongqing Municipal Library. The photographs displayed here, mostly from the Imperial War Museum, the Chongqing Library and the Chongqing China Three Gorges Museum, some never shown to the public, bring together stories of perseverance and determination by the citizens of two great cities. 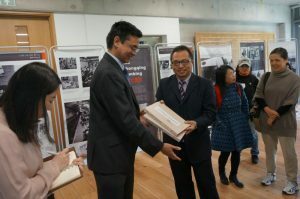 On 30 April 2018, a Chinese delegation led by Mr Bo Zhang, Deputy Head of Chongqing Library, attended the opening ceremony of the exhibition. Rana Mitter, Director of the China Centre, gave a welcome speech followed by a speech by Mr Zhang. Dr Annie Hongping Nie, UK curator of the exhibition, also gave a talk. The exhibition in Oxford will be open until to 30 June 2018. At Chongqing Library, it will be on display from 1 August 2018 onwards.